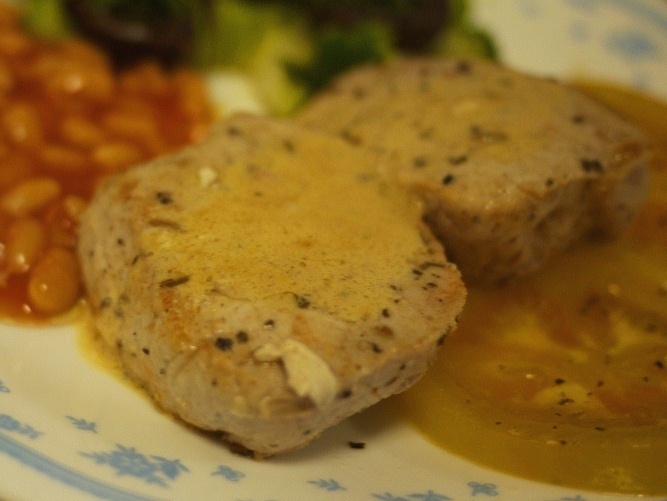 When we were little, pork chops were considered a special treat dish. Or was considered as a non economical meal compared to our usual meals of more vegtables than meat. So whenever the occasion (or her greedy children asks persistently) calls for it, mum would take special care to make sure that the pan grilled porkchops are made to perfection. She would first prep the pork loin by hammering it with a heavy meat tenderizer while we gleefully arranged the table with forks and knives instead of the usual chinese style chopsticks/fork & spoons. And the pork chops were always accompanied by warmed (canned) beans and fries. Actually, it’s quite typical of what we get from the ‘western food’ hawker stalls in Singapore. Western food, be it pork chops, fish & chips or grilled chicken are almost always accompanied by fries/coleslaw salad (very KFC-ish) and canned beans. Ahh childhood food! Anyway, I’ll always devour the mains and end up mixing the tomato sauced beans with the pork chop brown sauce, something like mashed beans. Yumms. 1 fennel. Quarter the bulb, thinly slice the harder stalks. Heat a large skillet. When hot, add a generous amount of olive oil. Add the quartered bulb of fennel to one side of the pan, the thinly sliced stalks to a corner at the other side and basil/sage to the remaining corner. Add more oil if necessary. We are doing 3 things in the pan: pan-grilling the quartered bulbs till slightly caramelized (turn when necessary), sautéing the sliced fennel stalks till it’s soft and frying the herbs till it’s crispy. Add a touch of salt and pepper to each. Remove each item when it’s done. Transfer the fennel bulbs and stalks to a low oven to keep warm. Add a little olive oil to the hot pan. Add pork chops and pan-grill for 2 mins a side or till it caramelized slightly and can be easily released from the pan. Remove pork and transfer to the low oven to keep warm. Add alcohol of choice and vinegar to the hot pan and scrape with a wooden spatula to deglaze. Add apple slices. Cook for about about 3 minutes over medium heat. Remove the apples and set aside. Turn off the heat and whisk in butter to complete the pan sauce. Plate. 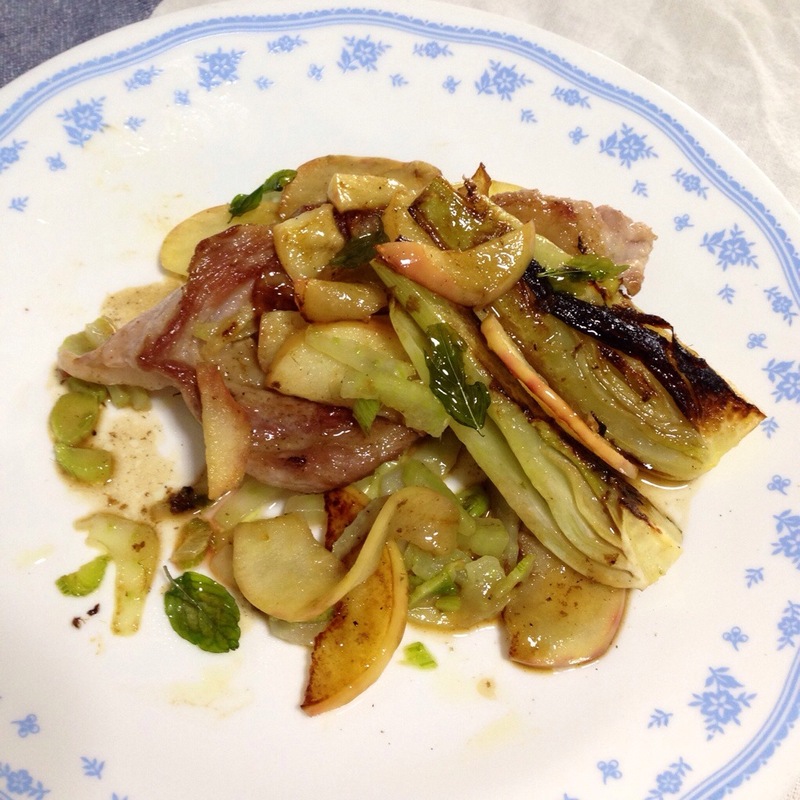 (I need to work on this..what I did was: lay a bed of sautéed fennel stalk slices and a few slices of apples, sit the pork chop on the bed, arrange 2 fennel quarters on the chop, scatter remaining apple slices and crispy herb. Finally drizzle the pan sauce over). 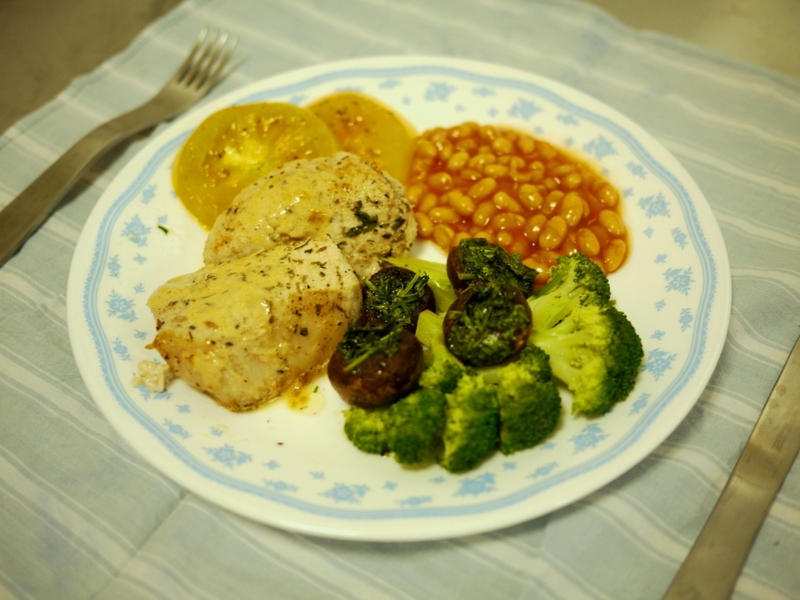 This entry was posted in Cook and tagged pork chops on May 7, 2014 by three3seconds.